Celebrating Divine Mercy with kids can be a great way to teach about God's forgiveness and love. I especially like to work it in while talking about or preparing for the Sacrament of Reconciliation, giving kids a model of the forgiveness that Christ wants to extend to them. 2. Color the heart and the globe, but leave space in the "scribbles." ...only you won't be able to see them yet. 6. Now for the big reveal. Here is where you really want to talk about the meaning of Divine Mercy and the symbolism found in the image of Divine Mercy revealed to St. Faustina. Check out the link at the very top of the post if you need more information. Remember where those white crayon lines were? Remind the kids that the Blood that flowed from Christ's side at His Passion is the Blood that washes us clean and atones for our sin. You should also talk about the connection to the Sacrament of the Eucharist. Have them use red watercolor paint and go over the white lines on the left side of the picture. See how the rays show through? A great object lesson to remind the kids that God's mercy is there even when we can't see or feel it. 7. Do the same thing with blue paint on the right side, symbolizing the cleansing power of the Sacrament of Baptism. The white rays shine through again, reminding us that the mark of our Baptism is strong and important, even though we can't see it. The Blood and water flowing from the Heart of Christ is given to everyone, and we are reminded of the main response in the Divine Mercy Chaplet, "Have mercy on us and on the whole world." 8. Want your art to match the Image of Divine Mercy even more? Paint or color the background of the page black, reminding us of the darkness of life without Christ. Love your work and wonderful ideas. Thank you. Thanks for letting me know, Julie! I actually have used many coloring pages from your site already- especially the Saint ones! Do you have a talented artist in your parish who creates these? They are so great! What a beautiful project! Thanks for sharing your ideas and artistic talents! I love all your ideas, Katie! Thank you so much for sharing--you make my life as a homeschooler much easier. God bless! Thanks for the lovely art ideas. I'm a 'teacher' too- we homeschool and I've found some neat faith based things from your site. Guess I know what we'll be doing for art this soon. 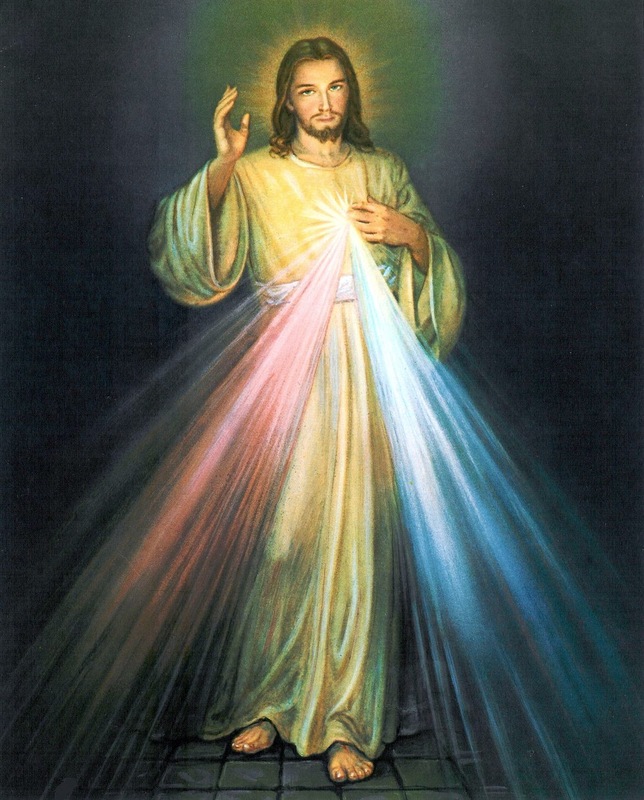 I love this Divine Mercy one and I think the kids will too. Thanks, Cecilia! This is one of my favorite projects :). I hope your kids loved it!